Teaching little ones about self-care and introducing them to chores. Have you seen your toddler brush their doll’s teeth? Or have they taken “teddy bear to the doctor” for shots? That’s because they are exploring and understanding what it means to be healthy and safe. And as a parent, there are many ways you can nurture what they now know about taking care of themselves. When your toddler is between the ages of two and three years old, they are growing into a taller, bigger, stronger body that can do more new things every day. Now is a great time to introduce concepts of self-care and responsibility. “I can take care of myself”. Every day, toddlers are finding out they can do amazing things on their own. They can be responsible, and they can take care of themselves too! Following routines helps them put what they learn into practice, while also learning what to expect and what is expected of them. Make a routine chart that fits your toddler’s pace, and talk about what each word or symbol in the chart means. It will take a little bit of practice, but after a few times, your little one will know what comes next. 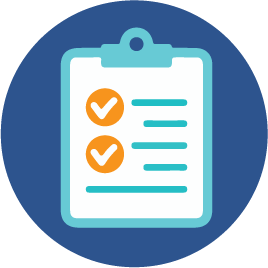 In the morning or in the evening, all you have to say is “go get your routine chart.” And, if calmer, happier mornings and evenings are one of your family goals, a routine chart may be a key part of making that goal a reality. Your child is now able to do some of their teeth brushing on their own, with some supervision. Let them be in charge of this important self-care task by adding it to their routine for mornings and nights. If they resist, try taking turns brushing. Help them finish up until they get a hang of this life-long habit. Read more about caring for your child’s teeth. Learning how to dress oneself takes practice. Starting with socks or jackets or letting them take their time while getting undressed is a good start. Let your child conquer one item of clothing at a time. Or more if they get really good at it. By age four or five, a child is usually able to dress themselves all on their own. Two and three-year-olds are learning to be independent. And that means learning to use the toilet! 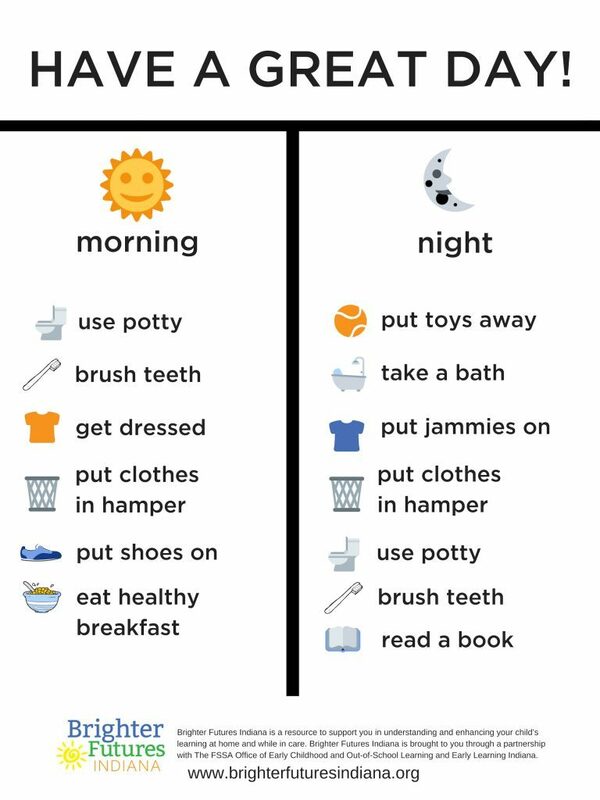 Adding “use potty” to their routine chart lets them expand their learning to understand that they can take care of their own needs in this way. Is your little one having trouble remembering to wash their hands after using the potty? Add it to their routine chart too. You can also make a special routine chart for potty time. Read more about ditching the diapers. “I can do chores too”. Putting clothes in the hamper. Your child can dress and undress on their own — hurrah! Their motor skills are developing, which means they can now make sure to put their clothes in the hamper after they are done wearing them. Picking things up and putting them where they belong is another easy chore. Your child is now responsible for clearing the area where they play.